김남수, 강훈, 권민선, 장효상, 김종구,(2016).수치모델을 이용한 진해만 내 소규모 내만의 해수교환율 비교.한국해양환경·에너지학회지,19(1),74-85. 진해만의 소규모 내만인 당항포만, 당동만, 원문만, 고현성만, 마산만에서의 해수교환율 평가를 위하여 EFDC 모델을 이용해 진해만 전체의 해수유동을 재현하고, 라그랑지(입자추적) 및 오일러(염료확산) 모델기법을 병행하여 해수교환율을 각각 산정하였다. 그 결과 입자추적 방법으로 산정한 해수교환율은 당항포만에서 60.84%로 가장 높고, 마산만에서 30.50%로 가장 낮게 평가되었고, 염료확산 방법으로 산정한 해수교환율은 당항포만에서 45.40%로 가장 높고, 마산만에서 34.65%로 가장 낮게 평가되었다. 당항포만에서 해수교환율이 가장 좋은 이유는 좁은 만 입구로 인한 유속의 가속화 때문이며, 입자추적 방법의 경우 입자가 빠져나갔다가 다시 들어오기 힘든 형태적 특성 때문으로 판단되었다. 한편, 라그랑지 입자의 경우 낙조류에 의해 만을 빠져나갔다가 창조류에 의해 다시 유입될 때 온전한 입자가 그대로 유입하지만, 염료의 경우에는 만을 빠져나간 후 다시 유입하더라도 외해수에 의해 희석되어 유입하기 때문에 염료확산 방법으로 산정한 해수교환율이 전반적으로 더 높게 나타나는 경향을 보였고, 두 가지 방법에 의해 산정된 해수교환율은 같은 조건에서 비교하더라도 상대적으로 전혀 다르게 나타났다. 따라서, 해수교환율을 평가할 때에는 이 두 가지 방법을 병행하거나, 연구의 목적 및 해역의 특성을 충분히 고려하여 모델링 기법을 선정해야만 보다 합리적인 결과를 얻을 수 있을 것으로 판단된다. 한편, 폐쇄도 지수와 라그랑지 및 오일러 방법으로 산정한 해수교환율을 비교한 결과, 폐쇄도 지수가 높을수록 수치모형 기법에 상관없이 해수교환율이 높게 나타났다. 따라서, 폐쇄도 지수가 만의 폐쇄성을 지시하는 지수로 사용하기에 적합하지 않고 수정 및 보완이 필요하다고 판단되었다. For the assessment of seawater exchange rates in Danghangpo bay, Dangdong bay, Wonmun bay, Gohyunsung bay, and Masan bay, which are small-scale inner bays of Jinhae bay, an EFDC model was used to reproduce the seawater flow of the entire Jinhae bay, and Lagrange (particle tracking) and Euler (dye diffusion) model techniques were used to calculate the seawater exchange rates for each of the bays. The seawater exchange rate obtained using the particle tracking method was the highest, at 60.84%, in Danghangpo bay, and the lowest, at 30.50%, in Masan bay. The seawater exchange rate calculated based on the dye diffusion method was the highest, at 45.40%, in Danghangpo bay, and the lowest, at 34.65%, in Masan bay. The sweater exchange rate was found to be the highest in Danghangpo bay likely because of a high flow velocity owing to the narrow entrance of the bay; and in the case of particle tracking method, the morphological characteristics of the particles affected the results, since once the particles get out, it is difficult for them to get back in. Meanwhile, in the case of the Lagrange method, when the particles flow back in by the flood current after escaping the ebb current, they flow back in intact. However, when a dye flows back in after escaping the bay, it becomes diluted by the open sea water. Thus, the seawater exchange rate calculated based on the dye diffusion method turned out to be higher in general, and even if a comparison of the sweater exchange rates calculated through two methods was conducted under the same condition, the results were completely different. Thus, when assessing the seawater exchange rate, more reasonable results could be obtained by either combining the two methods or selecting a modeling technique after giving sufficiently consideration to the purpose of the study and the characteristics of the coastal area. Meanwhile, through a comparison of the degree of closure and seawater exchange rates calculated through Lagrange and Euler methods, it was found that the seawater exchange rate was higher for a higher degree of closure, regardless of the numerical model technique. Thus, it was deemed that the degree of closure would be inappropriate to be used as an index for the closeness of the bay, and some modifications as well as supplementary information would be necessary in this regard. Cho, J.K., Kim, D.K., Lee, M.O. and Oh, T.G., 2010, “A Numerical Estimation on Extension of Marine Afforestation Area using Particle Tracking Method”, J. Korean Soc. Mar. Environ. Eng., Vol. 34, No. 6, 922-934. Hamrick, J.M., 1992, “A three-dimensional environmental fluid dynamics computer code : Theoretical and computational aspects”, The College of William and Mary, Virginia Institute of Marine Science, Special Report 317, VA. 1-63.
International EMECS Center, 2001, Environmental Guidebook on the Enclosed Coastal Seas of Japan (88 sea areas), 1-177. Jang, C.H., Kim, S.T., Kim, H.S., Kim, K.H. 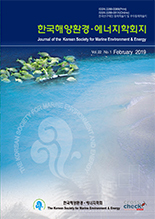 and Song, M.S., 2010, “Efficiency Tests of Seawater Exchange System for Enhancement of Seawater Quality”, J. Korean Soc. Mar. Environ. Eng., Vol. 13, No. 3, 206-215.